Yesterday, I did something I hadn't ever before. I went to an Ash Wednesday service at my (Episcopalian, though it's now questionable how much longer Anglican) church, heard the invitation to the observance of a holy Lent, recited the Litany of Penitence, and submitted my forehead to the imposition of ashes, gently applied by our Assistant to the Rector, The Rev. Sonia Waters, as she softly reminded me, "Dust you are, and to dust you shall return." I have no issue with that statement; it's the question of resurrection and afterlife, among others, that I find a challenge. For some time, I've been a practicing, though not necessarily a believing, Christian. I did get a grin from our Rector, The Rev. Stephen Muncie, at a dinner some weeks ago when he said he was tired of hearing people say, "I'm not religious, but I am very spiritual", and I replied, "I'm just the opposite." His smile didn't fade when I went on to say that I'd never had a "spiritual" experience, and that I had serious issues with what most Christians consider essential beliefs. It broadened a bit when I said I got great satisfaction from practicing "religion"; that is, from participation in liturgy and in the life of the church community. He did wince when I said that I entertained the idea that there is no transcendent God, but simply a human construct that has taken on a life of its own and become essential. I have decided, this year, to take my commitment to practice to the extent of undertaking a Lenten discipline. Traditionally, this is seen as giving something up; usually meat and alcohol (more recently, just the latter). I'm abstaining from ardent spirits (but not from wine or beer with meals, both of which I consider food) and the ice cream bars that I usually have with a snifter or two of Cognac after dinner, often as I work on this blog. This is likely to improve my waistline; it may even improve the quality of my posting. Whether it will improve me in other ways is questionable. But, as Steve said in his Ash Wednesday homily, Lent isn't primarily about abstemiousness, it's about concentration on essentials. In that respect, I hope I can use this time of reflection to become more thoughtful about my work, my relationships, and, yes, even my blogging. We'll see. A friend and I were browsing in the Metropolitan Museum of Art gift shop when he said, "Publishing this was sure a risk." 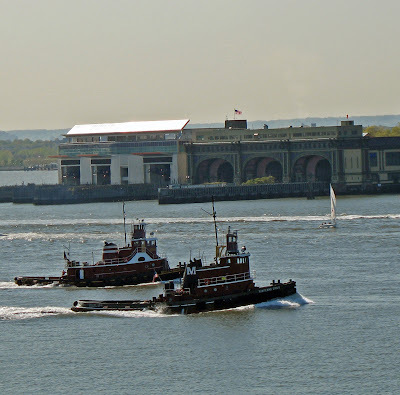 He was holding a coffee-table book of photographs of tugboats in New York harbor. "You mean, because the market for tugboat photographs is likely to be very small? ", I said. "Uh, huh. I mean, it's basically just an engine room mounted on a hull."